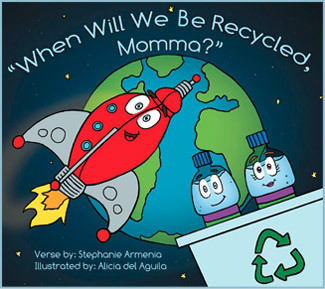 Local author Stephanie Armenia wants to raise awareness about recycling in Florida Public Schools. She has designed an exciting new outreach to encourage the habit of recycling early in life by focusing on second graders and plastic water bottles. Sponsors are needed to help underwrite the cost of printing these educational books. According to Stephanie: “The centerpiece for the project is the book When Will We Be Recycled, Momma? which will be donated to all second graders in Hillsborough County Public schools this year. 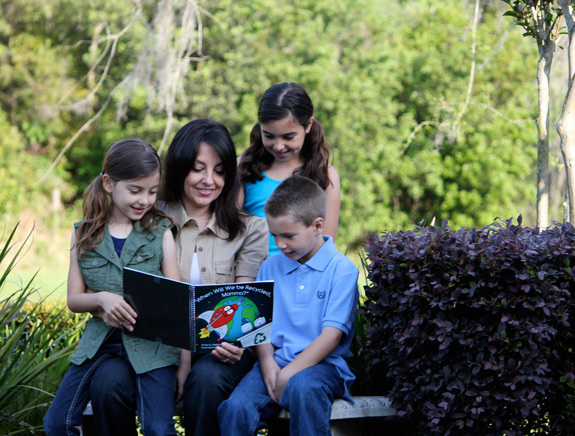 We are seeking funding from families and companies to help underwrite the printing costs of the books.” Armenia is working with Tampa Bay Beautification to develop a comprehensive educational program that includes a teacher’s guide and extension activities that correlate to all Sunshine State and national standards. The One Bottle One Dream recycling project will launch on April 21, 2011, at McKitrick Elementary in Lutz, Florida. It will continue through National Recycling Week, November 8-13, 2011. A kick-off ceremony will be held at 8:30 AM on April 21st at McKitrick Elementary School in Lutz. For more information on the program or to see how you can donate, please contact Stephanie Armenia at 813-624-4355 or Sarmenia1@verizon.net or Tampa Bay Beautification at 813-221-8733 or patricia.deplasco@tampabaybeautification.org. Visit the new One Bottle One Dream Facebook page for more information. To find other eco-friendly businesses and events in the Tampa area, please visit my website, GoingGreenTampa.com! This entry was posted in News on April 11, 2011 by admin.